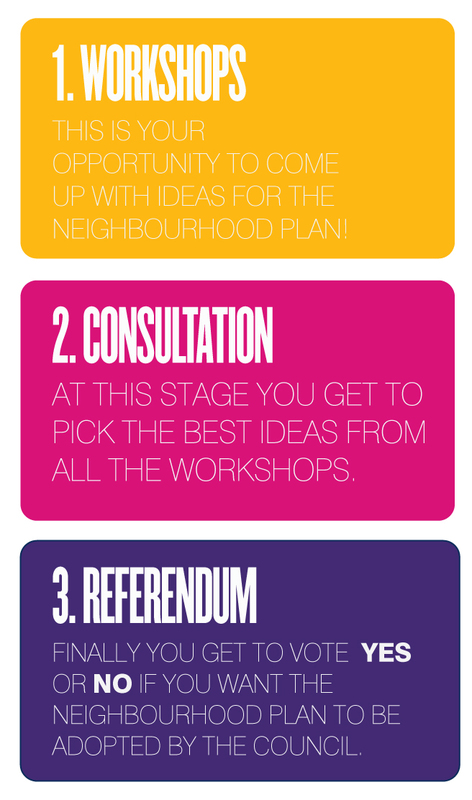 We will be involving the wider community in three stages of the plan making process as set out below. The WORKSHOP stage gives everyone the opportunity to come up with issues, opportunities and ideas for policies to include in a Draft Plan. The CONSULTATION stage gives everyone the opportunity to vote and prioritise the emerging policies and the REFERENDUM gives everyone the chance to vote for or against the Final Plan. Anyone who wants to be more involved can also formally join the Neighbourhood Forum.